Did Valentine’s Day creep right up on you without even a candy heart changing hands? Well, treat your sweetie (or yourself) to not one, but two classic slices of cinema this Saturday night. 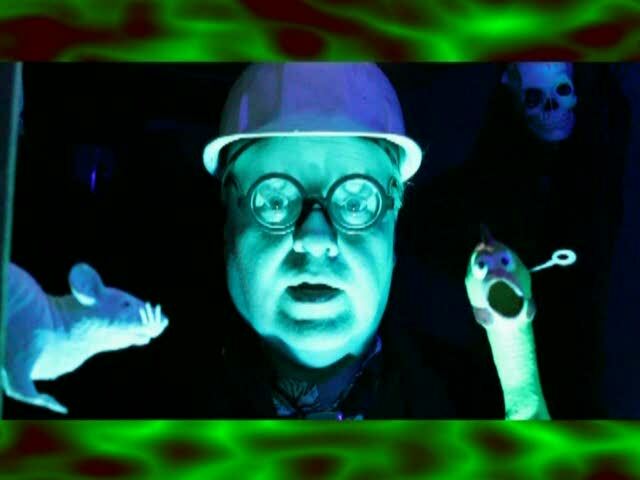 Join UNCLE PETE for a double dose of disaster this week in THE DARK VAULT OF PUBLIC DOMAIN as he traipses through the uncharted corridors deep in the Dark Vault Crypt beneath the Cinema Graveyard. The first nugget stars one of our favorite scary guys – Bela Lugosi. It’s Murder By Television. The brilliant Professor James Houghland (Charles Hill Mailes) has discovered a way to instantly broadcast television signals anywhere in the wold. All the networks want to get their hands on this, but he won’t sell (we here in the Dark Vault have discovered the original blueprints, but El Vato spilled grape juice on them and we can’t read a thing). When the professor is murdered during a demonstration of his invention, it’s time to do a little investigatin’. It also stars June Collyer and Huntly Gordon and, before Hattie McDaniel was forced to take parts in such obscure and minor movies as Gone With The Wind and Song Of The South, she was able to land a juicy role in this feature as Isabella the Cook. From 1935, it’s Murder By Television. Then it’s back to the Bowery for another adventure with our favorite juvenile delinquents. From 1942, it’s Let’s Get Tough. Pearl Harbor has just been bombed, and Muggs, Danny, Glimpy and the rest of the boys want to join up with the army or navy or anybody that’ll have them and give those Japs some what for. But they’re too young, so they decide to see what they can do around their home turf. When a Chinese shopkeeper is murdered, the gang stumbles onto a spy ring. And to add trouble, it looks like Danny’s brother, who was dishonorably discharged, might be mixed up in it. Directed by Wallace Fox and starring Leo Gorcey, Bobby Jordan, Huntz Hall, David Gorcey and Sunshine Sammy Morrison, it’s Let’s Get Tough. And as difficult as it may be to believe, UNCLE PETE has reached new depths this week in the Dark Vault Crypt. He’s so far subterranean that they’re pumping air in and he’s had to bring a Rubber Safety Chicken with him just to monitor the quality of the air down there (or whatever it is that he’s actually breathing). Will we discover the professor’s murderer? Will the Gang break up that spy ring? Will El Vato quit stepping on the air hose? Tune in this Saturday night, February 15, 2014 from 10PM til midnight on channel 4 in the Grating Binghamton area, channel 17 around Sayre, PA, and channel 99 for the Elmira/Corning area for Murder By Television and Let’s Get Tough – our next Double Feature presentation in THE DARK VAULT OF PUBLIC DOMAIN! ~ by UNCLE PETE on February 13, 2014.